3:52pm: The teams have announced the trade. Darren Wolfson of 1500 ESPN tweets that, for now, the sense is that the Twins will hang onto Forsythe. It’s possible, perhaps, that Minnesota will be able to find a taker for a portion of his contract in August if he performs well, though as a free agent at season’s end, Forsythe presumably isn’t viewed as any sort of long-term piece. 2:28pm: The two sides have a deal in place, reports ESPN’s Jerry Crasnick (on Twitter). Dozier is headed to Los Angeles. Joel Sherman of the New York Post tweets that Minnesota will take on Logan Forsythe’s contract in the deal and will also receive prospects Luke Raley and Devin Smeltzer in the swap. 2:23pm: The Dodgers and Twins are nearing a trade that’d send Brian Dozier from Minnesota to Los Angeles, according to Ken Rosenthal and Dan Hayes of The Athletic (Twitter link). The trade of Dozier brings to an end the tenure of one of the best players in recent Twins history and also at last pairs Dozier with the Dodgers, who invested a significant amount of time in trying to acquire him in the 2016-17 offseason. 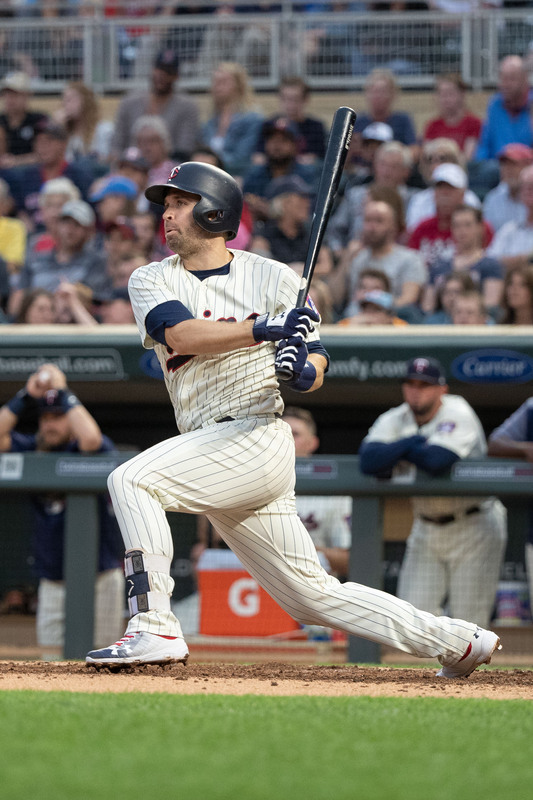 While Dozier isn’t having nearly the season that he had in his best two years with the Twins, the 31-year-old is at least showing some power, with a .224/.305/.402 slash and 16 homers on the season. What remains to be seen is precisely how Dozier will be shoehorned into an already tight L.A. infield mix. The Dodgers currently have Justin Turner on the disabled list, which alleviates the logjam a bit, but they’ll soon have an infield with Turner at third, Manny Machado at shortstop, Max Muncy at second base and Cody Bellinger at first base. Bellinger, of course, can play in the outfield, as can current shortstop Chris Taylor (who’ll slide back into a utility role once Turner is back). Then again, the Dodgers have never fretted much over regular positions and/or playing time for most players under current management. Rather, harvesting incredible amounts of depth has become a hallmark of this front office, and today’s addition of Dozier only furthers that reputation. Skipper Dave Roberts will be able to mix and match his lineups with quite a bit of creativity — particularly if the Dodgers give Dozier occasional reps at third base or at the position he played upon breaking into the Majors: shortstop. At the very least, Dozier will give the Dodgers a potent option against left-handed pitching — both down the stretch and in the playoffs. Through 1082 career plate appearances against lefties, Dozier has impressed with a .277/.356/.516 slash and 48 home runs. That’ll prove especially useful against the Rockies (Kyle Freeland, Tyler Anderson), Cubs (Jon Lester, Jose Quintana, Cole Hamels, Mike Montgomery) and Braves (Sean Newcomb, Max Fried) — each of whom is currently in the NL playoff picture. Dozier is playing out the final season of a four-year, $20MM deal with the Twins and is earning $9MM in 2018. His salary, then, will be canceled out by that of Forsythe, who is also earning $9MM and may or may not ever suit up and play a game for the Twins down the stretch. The 31-year-old Forsythe has had a terrible season at the plate, hitting just .207/.270/.290 through 2011 plate appearances. Los Angeles had previously tried to unload him in other trade talks, and his inclusion in the deal is assuredly a means of keeping the Dodgers beneath the $197MM luxury tax threshold. It’s possible that the Twins will simply cut ties with Forsythe immediately and turn Dozier’s second base spot over to a younger option with more of a future with the team. The 23-year-old Raley is the primary return for the Twins, ranking 19th among L.A. farmhands, per Jim Callis and Jonathan Mayo of MLB.com. A seventh-round pick in the 2016 draft, Raley has steadily risen through the Dodgers’ ranks and hit well along the way, topping out in Double-A to this point in his career. Through 435 plate appearances at that level so far in 2018, he’s posted a .275/.345/.477 slash with 17 homers, 17 doubles and five triples. Callis and Mayo note that with slightly above-average speed and arm strength, Raley can handle either corner outfield spot, though he’s also capable of spending some time in center field or at first base as needed. Raley hasn’t walked all the much at the Double-A level (5.4 percent) and has struck out at a 24 percent clip, but he gives the Twins another corner bat with some decent offensive potential to slide into the middle tier of the farm system. Smeltzer reached Double-A as a 22-year-old and has struggled against older, more experienced competition, posting a 4.73 ERA with 7.2 K/9 against 2.0 BB/9 with a 36.6 percent ground-ball rate at that level this season. He’s been primarily a starter in his pro career after being drafted in the fifth round back in 2016, though he’s worked in relief a bit this season. That’s the role Eric Longenhagen of Fangraphs pegged him for back in 2016 when ranking him 25th among Dodgers farmhands. Smeltzer hasn’t appeared on Dodgers rankings since that time, but he’s displayed excellent control as a pro, averaging fewer than two walks per nine innings pitched while also showing an aptitude for missing bats prior to this year’s more average marks in that regard.